Recently, I've started started using Gwynnie Bee. For those who haven't heard of the site. 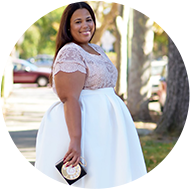 Gwynnie Bee is like Netflix for plus size clothing. I'm on the 3 piece plan ($79/month), which allows me to get 3 pieces per shipment with unlimited swaps. You can literally wear and switch out clothing all month long. I took two weeks to really try out the program and get a feel for how it works, so I could deliver a full report on my experience. I'm always asked, how can I be fashionable on a dime. I honestly can't think of a better way than joining Gwynnie Bee. You can swap clothing out month long and literally have something new to wear every time you step out. Who doesn't love to have new clothing on. Their most popular program is 3 pieces for $79/month with unlimited swaps. Moving to the very expensive Bay area, Gwynnie Bee has definitely allowed me to stretch my clothing budget. I'm the worst when it comes to wearing items one time and never looking back. I think it's the curse of loving fashion. I wear something then I'm ready to move on the the next thing. Gwynnie Bee allows you to keep your closet clear of one-hit wonders, saving you both money and closet space. At first, I didn't know if Gwynnie Bee was for me. The wearing borrowed clothing thing made me apprehensive. What got me over this hurdle is a few of factors. One, I wear foundations, so most of my clothing barely even touches my bare skin and I shop thrift. Thrift is probably the worst of "pre-worn" clothing in terms of smell and cleanliness, but as long as you wash or get it dry cleaned then it's fine. Lastly, I really went and read about their cleaning process. They go through a thorough inspection of items and retire items that no longer meet their high standards. I've gotten a total of two boxes in so far and the clothing is in like new condition and smells good (Yes, I smelled the clothing). Gwynnie Bee claims that with could get up to 12 new pieces per month to wear. I agree. I got some pieces shipped them back and in 2 days I had new pieces in my mailbox. You can tell the site that you have shipped back, so that they can prepare your new shipment which allows a quicker turnaround of your new items. They also provide pre-paid shipping bags, which allows you to easily mail back your items. Most plus size shopping happens online, Gwynnie Bee allows you to try items with no risk. You can get an idea of the sizing and try new brands. I think the best part thing is that Gwynnie Bee gives you a free 30 day trial You can try it out and see if the program is for you. I can tell you my experience, but this gives you a chance to have your own. You can get you free 30 day trial here. Style Note: My sister is visiting from San Diego. She's a MAC makeup artist and brought me so many goodies, including a limited pink lipstick called Silly. It's so pretty. I'm also really digging the double cuff trend. As one who has always had larger wrists, finding bracelets that fit is always a task. Cuffs are always the perfect solution, because you can bend them to accommodate your wrist size. Lulu Avenue generously provide these amazing cuffs. I think they are my new favorite accessory. Wondering about my foundation? I'm doing a special dedicated post this week. Stay tuned. Membership to Gwynnie Bee courtesy of GwynnieBee. Cuffs courtesy of Lulu Avenue. As always, opinions are my own. I have been a member for sometime also, and just didn't know how things worked. Now with a little help from your post I just may give it a try. By the way.. I love that dress great choice. Awesome!! I think what I didn't know is that you get to swap all month long :) Very cool! Do I see another baby making dress? Yes I see it 8) You look hot girl in that dress!!! You are werking it!! I just joined waiting on my order. Do you know how long it takes to send items when racks are filled? Yeah!!! 2 - 3 business days for me. It's shipped priority and fairly quickly. I love the dress and the jewels ! I'm so in Love with your Style!!! You`re amazing!! you're so pretty! that dress is beautiful! just gorgeous! love this dress on you and the pink lipstick adds for the special oomph! You look amazing! That dress loons banging on you! Your curves in this dress is amazing love it on you! I absolutely adore the dress, it looks amazing on you, you look lovely. But I have to admit, what I love the most about the outfit are the cuffs, they're way adorable. Women like you are such an inspiration nowadays! I love it!!!! You look radiant my love. I have been with Gwynnie bee for at least six months and I absolutley love them. They ship fast and they have the best customer service. :)) They ship fast too! Wow!! What a great writing, really I appreciate such kind of topics about garments. It will be very helpful for us. Where can we find this dress outside of gwynnie bee?? It's absolutely gorgeous!